A friend of mine (he has a blog over here) gave me an idea for a program. He wanted to know when his kids got home (and when they left). His idea was to have an application that would interrogate his wireless network to see if a specific client was associated with his Access Point. I started down the path of using SNMP to query the Apple AirPort Extreme he owns, but quickly gave that up. The main reason I gave up on that solution (which would have been perfect) is that Apple, in their infinite post-Jobs wisdom) has removed support for SNMP configurations from AirPort Utility 6.0 and has eliminated SNMP from their newer AirPort models. So, dead end there. So, I turned to the built-in support that I knew would be present: arp. The Address Resolution Protocol (ARP) is built into every operating system and allows you to map Ethernet MAC addresses into Internet Protocol (IP) addresses and even into human readable names (if you have reverse Domain Name Service (DNS) defined for those IP addresses). Name (my-ipad): Based on reverse DNS, you’ll see a human-readable name here, if not, you’ll just see a ? Now that you know what you have to work with, let’s determine our desired outcome. We want an automatic solution that identifies if a MAC address is currently visible on our network. We’re going to use what we learned about the Address Resolution Protocol above to see the devices join and leave our network. We’re then going to use a Python script that runs that arp command, processes the output, and “flags” our visible devices. Finally, we’ll use Hazel to monitor the “flags” and take whatever appropriate action we deem necessary. I put together two different phython scripts. The first script I wrote automatically named the “flags” based on the name shown in the arp command. However, I quickly realized that most folks don’t have reverse DNS service for their internal network, so all of their names will just appear as question marks (?). To combat that problem, I adapted the python script to allow you to pre-configure both the Name of the device and the MAC address of the device in a dictionary at the beginning of the script. Edit the MAC addresses and Names in the myKids dictionary at the beginning of the script. Add more by separating the entries with commas. Replace any spaces in the name you want to use with hyphens (-), as spaces will probably cause issues later. Edit the directory path for the “flag” which is actually just an empty file placed in the directory, found as the filename variable in the script. How do you get the script to run continuously? On most Unix-based platforms you’d use a cron entry. OS X calls these types of scripts LaunchAgents. Lingon X is a great tool for seeing all of your LaunchAgents (cron entries) and LaunchDaemons (automatically starting processes). You’ll have to purchase the version from their website to get full functionality (though there is a version in the Mac App Store, it is not the current version). That will configure your system to run the Python script (saved here in /Users/robpickering/Scripts/devicePresent.py) every 5 minutes. 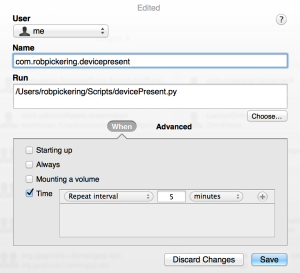 That in turn will create files in /Users/robpickering/Desktop that end in “.present”. Your script should now be running every 5 minutes and placing “.present” files on your Desktop (or wherever you told it to place them). You will now receive a Desktop Notification whenever a device you’ve configured in the shell script appears in your MAC Address Table.